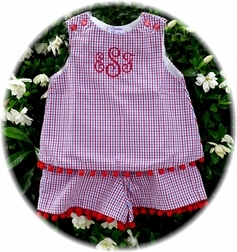 Caroline Bradlee Designs > HOLIDAYS > 4TH OF JULY & PATRIOTIC > Custom Girl's Patriotic Red, White And Blue Gingham Outfit. Here is one of our outfits made for the Spring/Summer, BUT it is also perfect for any patriotic holiday, event; especially for the 4th of July! 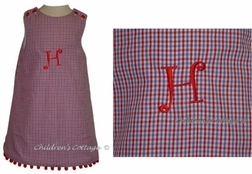 Add a big, bold monogram to personalize the outfit!